For those without comedic tastes, the "questionable parody" of this website called Wikipedia have an article about Balearic Islands. Island of Jotica. Inset: Kidney stone. Note resemblence. Located 300 km southeast of Marseilles, the five Balearic Islands enjoy a unique blend of Catalan culture, Mediterranean warmth, French cuisine, and Colonic disease. The islands, in order of size, are Jotica, Menorah, Ibseca, Foraminifora, and Koemma Island. Greek legend has it that the Balearics formed when Zeus passed five immense kidney stones and in his agony hurled them into the sea. Odysseus visited the islands and fought the half-man, half-snail monster Mucosides. Editors cut this particular scene out of the final version of The Odyssey because the fight ended in the first round when Odysseus simply trod on Mucosides. The islands were part of the Roman Empire, then ceded to the Frankish hordes, then conquered by the Moors, then the Spaniards. An attack by a British warship was repulsed, but shortly thereafter the islands were captured by the Quebecois, occupied by the Nazis, captured by the British, then conquered by a pastry chef from Lyons named Jean Bienvenue, a herd of wildebeest, and then by a bactrian camel named Clyde. 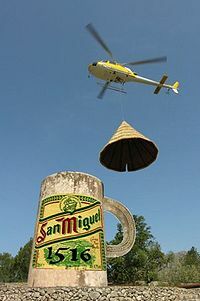 A government helicopter lowers a protective cover onto a public beer stein on Mallorca. These covers keep seabirds and small aircraft from falling into the potent brew. The main export from the Balearics is sunburn. All caviar must be imported to the Islands, and this is a heavy burden on the economy. Fishing for the unique achi-nachi yields only a few kilos of foul-tasting, useless minnows yearly; still, the traditional fishery continues -- apparently out of mindless habit. Most adults have jobs in the tourist industry, peddling sunburn to sharkbelly-white Germans and Swedes. However, the traditional beer-drinking industry remains a mainstay of island life. The government has placed large beer steins near many markets, public libraries, and schools; these steins are meant for public use and are refilled daily. Spanish breweries compete jealously for the Balearic market, as through the miracle of modern metabolism a single Menorcan may consume 500 times his or her weight in beer every day. Just as the lowly shrew or hummingbird must eat more than their body mass to stay alive, the islanders require near-constant infusions of beer. It's the only way they can stand the tourists. This page was last edited on 2 July 2012, at 04:00.